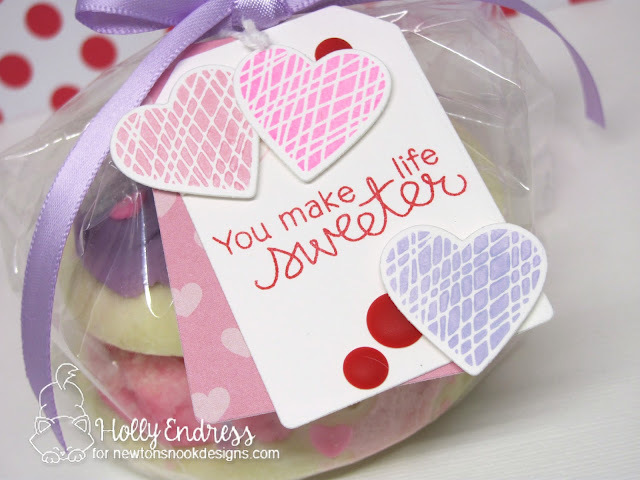 Hollybeary Creations : Sweet Treats Blog Hop with NND! 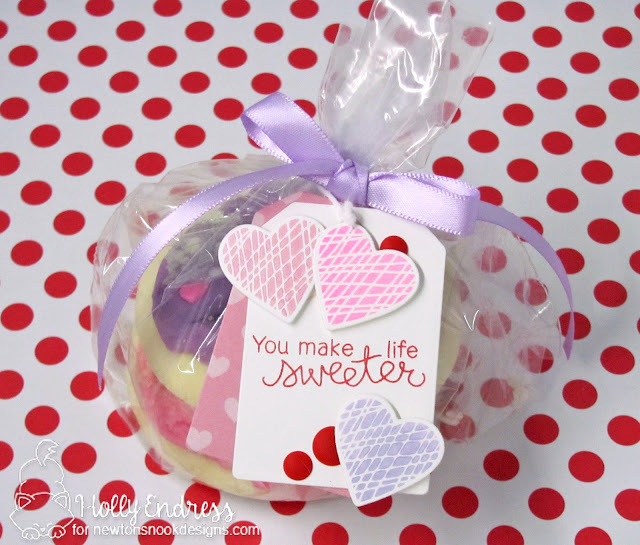 Sweet Treats Blog Hop with NND! Happy Saturday everyone.. We are having a Sweet Treats Blog Hop at Newton's Nook Designs. Join us as the Design Team share Fun Sweet Treat ideas using products from Newton's Nook. I created a treat bag tag using the Tags Times Two Die Set. I also used the Love & Chocolate and Woodland Duos stamp sets. I package some Valentine Cookies up in a small plastic bag and I tied it shut with a lavender ribbon. I coordinated everything with the icing and decorations on the cookies. I die cut the tag shape from a piece of White card stock and a piece of Pattern Paper. I stamped the sentiment from Love & Chocolate in some Red Pigment ink onto the tag. Then I adhered the second tag to the back offsetting it so it peeked through. I stamped the hearts from the Woodland Duos set in some additional coordinating Pigment inks and die cut them with the Darling Hearts Die set. I adhered them to the tag with some foam tape. For an extra pop of the Red color I added some matte enamel dots. 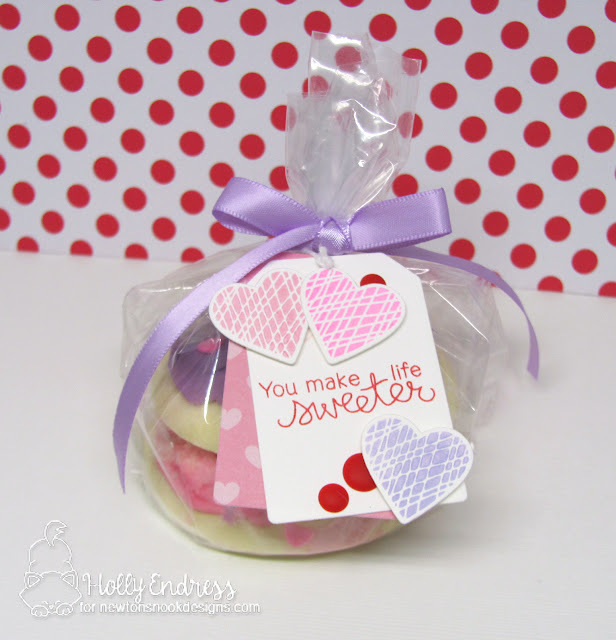 These would make a cute treat for a class valentine or just a treat at the office. Would you like to win a $10 store credit to Newton's Nook Designs online shop? This tag is too cute! What a great way to use a tag. I love the heart Stamps! Very cute tag and treat bag!! This looks soooo yummy :D great job! This is really cute and so sweet! Love the matching colors! Such a sweetheart tag! It's cute. What a pretty way to package up some beautifully decorated cookies - YUM! Cute tag! The hearts remind me of heart-shaped cookies. Oh my goodness, your tag on those cookies in the bag is adorable!!! Very sweet tag, love the pop of red with the subtle pinks and purple! Sweet Valentine treat! Love the pretty hearts! Very classic design that is spiced up by the criss cross design of the hearts. I like it! We have the same idea! Cookies with a cute tag attached! Love your tag, it's very pretty! Such a sweet tag! Thanks for sharing! The Love and Chocolate stamps would be perfect for the recipe scrapbook I am making for my daughter! Very sweet. I like the colors of the hearts. This would look so cute on treat bags for my bus kids! Lovely treat bag tag!Super cute!